"The days of 'happy ever after' are gone... These are dark times." The producers of The 10th Kingdom have taken a different tack, creating an original TV miniseries incorporating elements of well-known tales, aimed at an adult, culturally literate audience. The script supposes that the world of the classic fairy tales is divided into nine Kingdoms, with our own world as the "mythical" tenth, accessible only through magic travelling mirrors. The story concerns the efforts of an Evil Queen (Dianne Wiest) to usurp the throne of her stepson Prince Wendell (Daniel Lapaine); when he temporarily escapes into the 10th Kingdom, Virginia Lewis (Kimberly Williams) and her father Tony (John Larroquette) are unwittingly drawn into the political intrigue of the 4th Kingdom. Pursued by Wolf (Scott Cohen) and a trio of Trolls (Dawnn Lewis, Hugh O' Gorman and Jeremiah Birkett), our heroes encounter such familiar figures as Snow White (Camryn Manheim) and Cinderella (Ann Margret) as they fight to restore Wendell to his throne and find their own way home. Romance, danger and adventure ensue as Relish the Troll King (Ed O'Neill) and the Huntsman (Rutger Hauer) join in the hunt for the fugitive Prince. This may seem like a thin premise for a seven-hour miniseries, but the results are thoroughly entertaining. The story is episodic, structured as a "road movie" in the grand tradition of The Wizard of Oz, and screenwriter Simon Moore is a fine storyteller, keeping viewers interested in "what happens next." The film's pacing under co-directors David Carson and Herbert Wise never falters, and the hours really do fly by—the production's TV origins are evidenced by some awkward fadeouts and restarts, but DVD viewers benefit from this commercial-free edition, significantly reducing the original ten-hour broadcast running time. The series has some anachronistic moments and corny lines here and there, but The 10th Kingdom respects its inspirations. It uses traditional folk tale structures intelligently—events come in threes, riddles are keys to progress, good deeds and bad are justly rewarded—and preserves the darker elements of the Brothers Grimm—red-hot wrought-iron shoes, poisonings, beheadings and child murders. Most importantly, the major characters grow and change over the course of the story, maintaining the classical "trial-by-fire" coming-of-age themes of our culture's most enduring myths. There's no deeply involving emotional content or Shavian social commentary here, but the producers have come up with an original, lightweight epic, taking viewers for a fun, almost literary ride in the spirit of William Goldman's The Princess Bride and Piers Anthony's Xanth novels. The actors seem to be enjoying themselves, without ever becoming "spoofy" or taking the material less seriously than it deserves, and almost every performance strikes the right note. Dianne Wiest in an uncharacteristically villainous role is emotionally cold and deliciously nasty as the Evil Queen. Ed O'Neill stands out as Relish the Troll King, playing him as an effective leader, decisive and crafty—the character's sub-human intelligence manifests as an inability to see the bigger picture rather than as "comical" dimwittedness. Scott Cohen brings a highly animated energy to Wolf—he has to shoulder some difficult moments as a half-wolf seeking love and humanity, and he conveys his animal nature almost completely unaided by special makeup and effects. Daniel Lapaine plays Prince Wendell AND a dog magically masquerading as Prince Wendell, committing thoroughly to physical gags that would embarrass a less-daring actor. John Larroquette and Kimberly Williams ground the adventure with humor and a believable father-daughter relationship, and supporting players Warwick Davis, Rutger Hauer and Camryn Manheim give colorful, memorable performances. The 10th Kingdom was shot largely on location in Europe, lending a convincing realism to many of its settings, and the invented sets and costumes are well-designed and convincing (with the exception of the Swamp Witch's domain, with its Sid & Marty Kroftt-esque mushroom puppets). Many of the special effects matte and CGI shots are obvious, and the visual presentation feels constricted by the 1.33:1 aspect ratio of the small screen. But The 10th Kingdom depends on its script and performances, delivering on both counts with flying colors. The world of the Kingdoms is well-developed, and there are plenty of possibilities here—the film only visits 4 of the 10 kingdoms, and the miniseries' epilogue implies that there WILL be a sequel, declaring this to be the "First Book" of the 10 Kingdoms. I look forward to further exploration. Image Transfer Review: Artisan's DVD presents The 10th Kingdom in its original 1.33:1 full-frame aspect ratio, as shot for NTSC television. The reviewed version includes three sides over one DVD-18 and one single-sided single-layered DVD, ample space to contain the 7-hour miniseries and half-hour documentary with a decent data rate throughout. The transfer is solid—there's some detail lacking in outdoor scenes, where ground and tree textures sometimes become muddy in the distance, but this is likely due to the source. No artifacting or blocking is visible in scenes with tiny particle effects, smoke or other challenging content. The look of the film overall is a bit soft, and even fade-outs never invoke truly deep blacks, but this DVD surpasses the broadcast seen by most people, clean with no distracting flaws. Audio Transfer Review: The disc presents the TV miniseries' original soundtrack in Dolby Digital 2.0 surround sound. It's a fair-to-middling audio experience—dialogue and music are comprehensible and clear, but subwoofer-level bass is almost non-existent and the rear surrounds are muddied and limited by the matrixing inherent in 2.0. Most TV productions wouldn't benefit from a theater-quality audio mix, but The 10th Kingdom seems like an exception. I'm sure the DVD provides an accurate representation of the broadcast audio track, but I wish a true 4- or 5-channel surround mix had been prepared from the original source elements—it seems like a missed opportunity to enhance the home viewing experience. Brief biographies and filmographies cover major cast and crew members, with an emphasis on their television work. Cast members featured include Ann-Margret, Scott Cohen, Rutger Hauer, Daniel Lapaine, John Larroquette, Camryn Manheim, Ed O'Neill, Dianne Wiest, and Kimberly Williams; profiles for producers Robert Halmi Sr., Robert Halmi Jr., Brian Eastman and Jane Prowse, writer Simon Moore, and directors David Carson and Herbert Wise are also included. This is a nice series of illustrated text screens introducing the characters of The 10th Kingdom, with no "spoilers", so it's safe to read before beginning the series. Quite useful for a project of this scale, especially when viewing is interrupted for an extended period and a quick re-acquaintance is necessary. Characters profiled include Cinderella, Wolf, the Huntsman, Prince Wendell, Tony Lewis, Snow White, Relish the Troll King, the Evil Queen, and Virginia Lewis. In an interesting departure from the standard form, the Production Notes on this disc are structured as brief text-based Q&A's with various members of the crew, discussing topics related to the project's genesis and physical production. These aren't nearly as informative as a full-length commentary (not a feature of this set, 7 hours of discussion probably being infeasible), but they cover a few interesting topics. An on-screen supplementary map of the 9 kingdoms with a "hidden" 10th Kingdom icon (not terribly difficult to find) and one or two text screens describing each Kingdom. More than anything else on the disc, this small section reveals the scope of Simon Moore's mythology—several Kingdoms not seen at all in this production are described, and all sound like interesting places to visit. A 22-minute promotional special hosted by John Larroquette, featuring quite a bit of footage from the miniseries and very brief sound bites from cast and crew members. It's a typical network promo—there are some interesting tidbits, but very little detail or real information. I wasn't expecting to like The 10th Kingdom nearly as much as I did. It's great fun and possesses time-warping magic of its own—like a good book, it's hard to "put it down," and at both side breaks, I found myself putting in the next disc and watching "just a little while longer." Artisan's DVD features an acceptable transfer in a convenient package—its TV origins are evident and supplements are limited, but the main attraction is so entertaining the technical limitations of the production and DVD are soon forgotten. 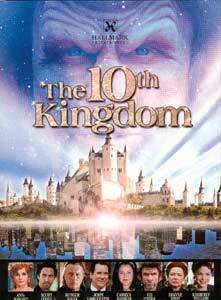 Even at nearly seven hours in length, The 10th Kingdom makes my "annual viewing" list of DVDs I expect to watch at least once a year for refreshment and renewal. Recommended.